Spray 3- to 4-quart slow cooker with cooking spray. In cooker, place potatoes, carrots and thawed onions. Sprinkle chicken with salt and pepper; place over vegetables in cooker. Pour gravy over top. Stir in thawed peas. Increase heat setting to High. Cover; cook about 15 minutes longer or until peas are tender. Chicken thighs are an economical choice for the slow cooker. They stay moist and tender during the long cooking process. 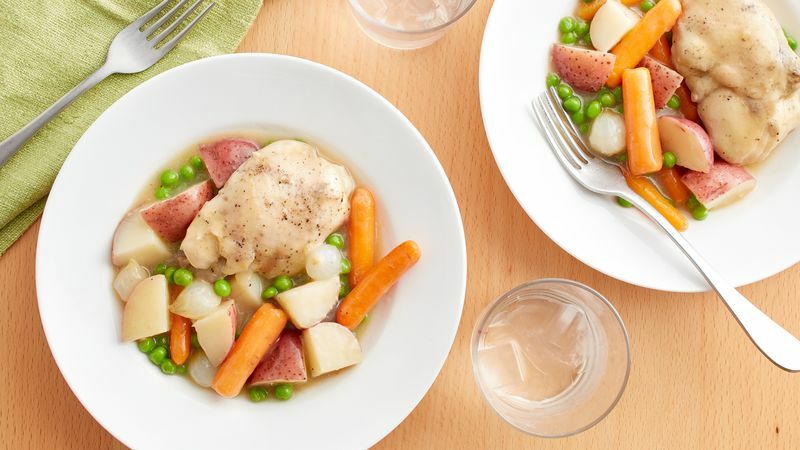 Place the peas in the refrigerator to thaw when you start the slow cooker in the morning. They’ll be ready to add at the end of the cook time.